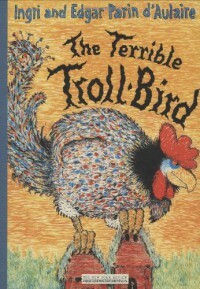 The Terrible Troll-Bird is the third book in this year's B-Day present to my niece, Claire (see my reviews of the other two: Supposing and Ounce Dice Trice), the most conventional of the three as it actually tells a story. In this case, the tale of Ola & his sisters, Lina, Sina and Trina. The story reminds me of Beowulf: A New Verse Translation: The terrible troll-bird (Grendel) is terrorizing the forest & village, and when it attacks Ola, Lina, Sina & Trina's farmhouse, Ola manages to kill it. Everyone in the village and the denizens of the forest celebrate at a great feast (where the troll-bird provides the main course) but then the bird's owners - the trolls Gygra and Jotun (Grendel's mother) - come down from the mountain to take revenge. Fortunately, trolls - as everyone knows - aren't very bright and they're caught out when the sun rises and turn to stone.